Just tested it does compile in Delphi 2007 - I will get to work on the bugs once I finish sorting the games I have to use with it, I worked around my own problems by making dosbox.exe switch the resolution then run dosbox_main.exe, then I discovered that the error I was having was fixed if I re-installed directx 9c manually after installing my PC - I used a RyanVM lite directx and it obviously has something missing in Windows 10 RS1- worked fine in Win 10 RS0 tho. Thank you for responding to this thread I have been checking for updates and thought it was never gonna get a response to help, but glad I was wrong. I have collected all the versions so I can base my builds off the existing ones without sourceforge, just until I see how well I can code in Delphi, been a loooong time since I used anything other than Visual Basic or Real Basic/Xojo now. Well, LiveFreeDead, if you will need some help you may ask (e-mail preferably). But I still hope that Alexander will comeback in some reasonable time. I have started looking in to this problem, I noticed in the Program Settings - User Interface - Image Scaling that if you change the method from B-spline it changed how the problem looked, I then went on to resize the icon you provided above and resized it from 314x314 to 256x256 using IcoFX and exported it as a png again this improved the look of the icon a little - until I changed the size to 128x128 in the settings. The remaining problem I see is the icon is applied to the tListView after it had been scaled on a solid background color, meaning mine is white (yours was black, due to the theme you have set) on all but the 255 (fully) transparent sections as the list view shows in binary transparency and not an alpha channel, I will look in to the issue to see if the list view used can accept alpha channels instead but this may be a limitation of the list view control and not a coding problem at all. I will edit this post as I find more. As far as I can tell he already has adopted the use of Common Controls v6 over the default v5.8 to fix the alpha channel issues in Delphi's ImageList controls, but I am new to the code so haven't found where he scales the images yet to see if he applies it to a solid color or not yet. The problem lays in "IconLoaderUnit.pas", I think it's to do with the variable clWhite or the CreateMask routine being used instead of the alpha channel being used it converts to binary transparency. I can't even get Delphi to show me a MessageBox from within this existing code, so although I could find a new way to process the image to work, I can't figure delphi enough to do it yet, lacking time to work on things, so I'll have to wait until I have some more to spend. ScummVM support is pretty well borked at this point. Nearest-neighbor scaling has been moved to the render_mode ini config option and there's no way at all to get it to work properly in D-Fend Reloaded v1.4.4. You can use OpenGL scaling by adding the option to the Filters but it upscales using bilinear interpolation. SedrynTyros wrote: ScummVM support is pretty well borked at this point. Nearest-neighbor scaling has been moved to the render_mode ini config option and there's no way at all to get it to work properly in D-Fend Reloaded v1.4.4. You can use OpenGL scaling by adding the option to the Filters but it upscales using bilinear interpolation. Can you explain (to someone who is not very knowledgeable in this area) what you mean by ScummVM support being borked? I have D-Fend Reloaded 1.4.4 and the Scumm games that I have added seem to be working (Full Throttle, Monkey Island, The Dig). Furthermore I don't see any parameter for "nearest-neighbor scaling" anywhere in scummvm documentation..
Am I limiting my experience by playing ScummVM games through D-Fend Reloaded in any way? Also, how can I get ScummVM to work as a portable install with D-Fend Reloaded? So, when you use OpenGL scaling it upscales the image using a nearest-neighbor algorithm, so you get a nice, crisp version of the original image versus what happens when an image is upscaled using a bilinear algorithm, where it ends up looking like you're viewing it through a glass of water; all blurry, hard to look at for more than a few minutes without getting a headache (so it amazes me that some people prefer it this way). SedrynTyros wrote: Yeah, I tried that already; it no workie. Adding a 2nd [scummvm] header seems to void some of the settings in the default one. It may work on the ScummVM version you're using but I've never used 1.9.0.2; it must be before the changes to render_mode that are present in the current daily builds. "opengl_nearest" isn't a valid selection any longer in the current builds. It's now just "opengl" with the nearest-neighbor scaling being moved to render mode. I want to use the current builds because they have updated Munt emulation that was added in December. So I've just been runnning ScummVM outside of D-Fend Reloaded. The long term fix for this is for the D-Fend Reloaded developer to change the way it handles the render_mode variable. So, does the build that I'm using (which I think is the "latest stable" build?) have MUNT emulation, but just an older version? I've only recently become aware of MUNT and the MT-32 and what it can mean for some of the Sierra games that I like to play (for example Space Quest 3 has incredible MT-32 music). I didn't know anything about this before. Now I have a special build of DOSBox with built-in MUNT support that I got from the Sierra help pages and I'm still figuring out exactly which games sound better with which sound drivers. As it relates to ScummVM games, what's the story there? Does ScummVM come with MT-32/MUNT support by default and is pre-configured to run this way, or do I need to adjust some things in order to get the best sound experience in ScummVM? What exactly is the "best experience"? ScummVM 1.9.0.2 has Munt 1.5.0 integrated into it. All the ScummVM builds have Munt now. The latest daily builds include Munt 2.0.1, but Munt 1.5.0 was pretty good. I haven't done a side-by-side comparison to see if the games I play are noticably better in Munt 2.0.1; I just wanted to use the latest version as it's usually an improvement over the old when it comes to Munt. But yeah, all ScummVM builds include Munt ... but you'll need to have the Control and PCM ROMs, of course. Either the MT-32 or CM-32L ones will do (but the CM-32L will have additional sounds in certain games). 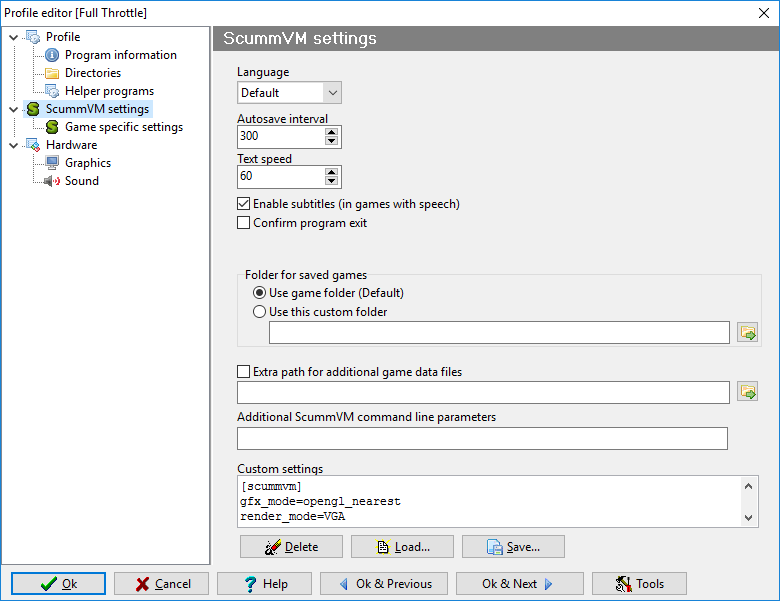 You just plop those ROMs in the ScummVM folder and you're good to go ... well, you do need to configure the game to use MT-32 as the sound option too. If I remember correctly, with Space Quest 3 you're going to miss out on some digital sound effects if you go with MT-32 for sound .... at least I think that's the case for that game ... I have it setup to use SoundBlaster emulation in my collection and I'm pretty sure that's the reason. SedrynTyros wrote: ScummVM 1.9.0.2 has Munt 1.5.0 integrated into it. All the ScummVM builds have Munt now. The latest daily builds include Munt 2.0.1, but Munt 1.5.0 was pretty good. I haven't done a side-by-side comparison to see if the games I play are noticably better in Munt 2.0.1; I just wanted to use the latest version as it's usually an improvement over the old when it comes to Munt. Hmm... I'm pretty sure one of the options is MT-32 with Soundblaster or something like that, which is what I use (talking about the setup.exe of Space Quest 3). I noticed that with only MT-32 you don't hear Roger say "where am I". So if I grab these files, do I need to change sound settings in ScummVM or is it automatically set up? You need to configure the game to use mt32 sound. I just checked and on the version of SpaceQuest III have (which I think game from the CD collection so probably the latest) the only sound option you have is Music. 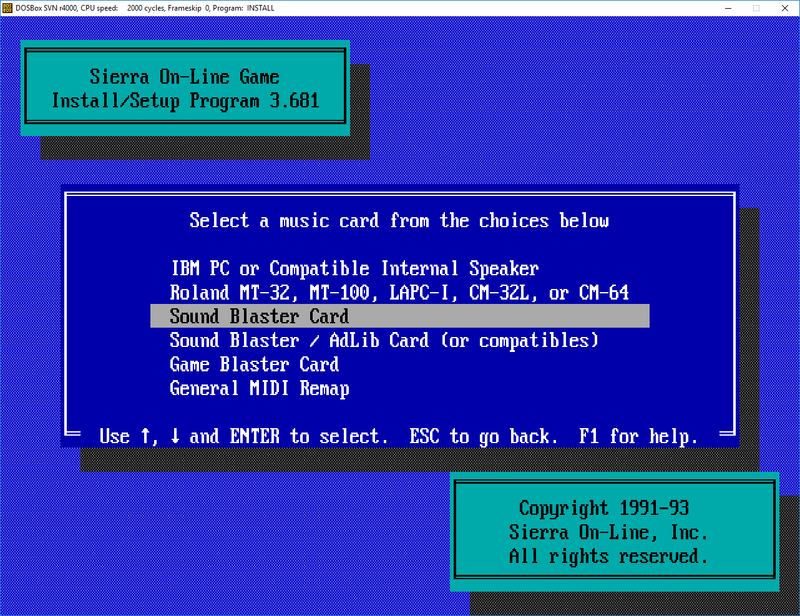 In most Sierra titles after this period you'd have a separate option for Music and Sound and could choose whatever driver to use for each. However, I think it's Space 1 VGA (the remake) where they give you the option to have MT32 + Soundblaster both in the same sound setting. How does one know which option is the best to choose for any given game? As far as I remember, the MTBLAST.DRV file doesn't get installed with Space Quest III so I'm wondering if it actually works properly with that game, allowing both MT-32 music and digital sound effects. Looks like you're using a fan-hacked driver. I'll have to track that down and try it. I think that I originally stumbled upon that driver in the steam forums for the Space Quest series. In fact, I think that Musically Inspired was involved in the discussion there and he may have posted the driver himself. But it looks like you can get it from running the SQ3 with MUNT installer (at the end of the first post), based on that discussion you linked to. Although I think I ran the VU 2006 SQ series installer from Collector''s website more recently, so it's possible it might be included in that as well. Anybody can share the D-Fend collection? Maybe there is a repository of screenshots and other things, because the built-in repository is almost empty. Once again came the nostalgia, I wanted to gather a beautiful collection of Dos-games, and I'm surprised that there is no single resource for such things. I googled on this things (d-fend collection, repos etc), but found nothing. Yeah, I've just been running my SCUMMVM games using the SCUMMVM interface for now. I don't play many SCUMMVM games to begin with and using D-Fend to launch them was a minor convenience that I live with not having. I am afraid that this project is dead like dosbox daum. The last visit of alexander on vogons since nearly two years (april 2016).